It is important for NYC FSBO home sellers to realize that a Flat Fee MLS Listing (RLS for NYC customers) listing is an ‘owner managed’ option. This means home sellers should not expect anywhere near the same level of service they would receive under a full service, full commission listing. With that said, an Agent Assisted FSBO (Flat Fee MLS) Seller will receive the same level of exposure to buyers as they would via a traditional full commission listing by having their home advertised in the RLS (REBNY Listing Service) broker database, StreetEasy, New York Times, Zillow, Trulia, Brownstoner and many other major real estate websites all at once. The Agent Assisted FSBO listing service is a highly effective option for sellers who are self-starters, proactive and ready, willing and able to invest time in the sale process. However, selling Agent Assisted FSBO isn’t for everyone. Listing via Agent Assisted FSBO is not a good idea If you’re unable or unwilling to do your own homework, short on time, lacking confidence and/or highly dependent on professional advice. What Are a Seller’s Responsibilities Under a Flat Fee MLS Listing? Is Phone Support Included With a Flat Fee MLS Listing? Why Is Hauseit so Strict on Setting Customer Expectations? Will Hauseit Agree to Work With All Agent Assisted FSBO Sellers? 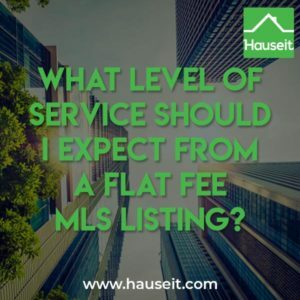 Is Using a Flat Fee MLS Listing a Good Idea for Me? What Are a Seller's Responsibilities Under a Flat Fee MLS Listing? An Agent Assisted FSBO seller in NYC is essentially responsible for all facets of the sale process with the exception of the online advertising / syndication of the listing. No. Agent Assisted FSBO Sellers must acknowledge and fully understand that there is no phone support of any kind implicitly or explicitly promised by the terms of the limited service Flat Fee MLS listing agreement they have signed. The owner must also understand that Hauseit is a marketing platform. Once a listing has been assigned to an affiliate listing broker, Hauseit is no longer directly involved in the sale process at all. That means all deal-specific questions by home sellers must be directed to the affiliate listing broker versus Hauseit. Any deal-specific questions in any format directed towards Hauseit by a seller after a listing has been assigned to a partner broker will not be answered by Hauseit. 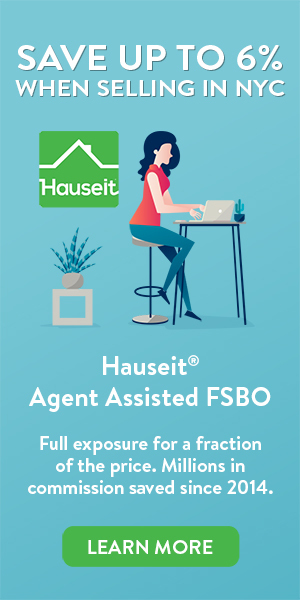 Hauseit simply asks the Agent Assisted FSBO customer to direct all questions to the affiliate broker they are paired with. With that said, there are a wealth of DIY resources including hundreds of highly detailed articles on how the sale process works on Hauseit’s blog. You are also welcome and encouraged to read the large number of previously asked and answered questions on Hauseit’s Customer Support Forum. If there is a topic we haven’t covered, simply post the question in Hauseit’s Forum or send us an email and we will make sure it’s answered. Please note that per the terms of the listing agreement, the affiliate broker is not responsible for any advice or phone support of any kind. Should you want the advice of the professional real estate broker you have been paired with, you can purchase a Professional Broker Consulting package for a low, one-time flat fee. Knowing how to handle inquiries from buyers and buyer brokers is an essential part of the skill set required for success as an Agent Assisted FSBO seller. The most important thing you can do is to respond to all inquiries in a timely manner. As an Agent Assisted FSBO seller, you’ll also need to remember that NYC real estate is a momentum-driven exercise. Buyers and buyer agents are not used to waiting days for answers to basic questions or confirmation of a showing request. They simply don’t care if you’re in the Hamptons for the weekend or if you can’t show during the day because you’re at work until 7pm Monday to Friday. After all, the majority of other listings on the market are being handled by full-service agents whose job is to be highly responsive and make properties available to show as quickly as possible. Just remember that as an Agent Assisted FSBO seller there are simply no excuses for being slow or unresponsive to interested buyers and buyer agents. If you’re traveling for work or away on vacation, the same rule applies: there are no excuses. Any time you spend out of the city and unavailable during the sale process will harm your progress relative to other listings on the market. If our affiliate forwards you an inquiry with specific instructions, please respond directly to our affiliate. This is usually because the inquiring broker has a history of wasting our various affiliates’ time and not having a real buyer. It is for your own protection to respond to our affiliate and not reveal your contact information to such a troll (agent without a real buyer). Here’s how to deal with trolls who may attempt to solicit and harass you. In order for us to truly amaze all of our customers, we must be firm in setting expectations so that we are able to provide the same, equal level of service to all of our customers. In a city like NYC full of aggressive, “Type A” personality working professionals, you are bound to meet some extremely demanding customers who are never satisfied and always want more value than they’ve paid for (Learn more: Why Agents Won’t Do A Flat-Fee MLS Listing in NYC). Therefore, in order for us and our affiliates to continue serving the wider NYC home buyer and seller community we must be firm in setting expectations with the occasional customer of this type. Sometimes people just need a reality check! In one of the most expensive cities in the world, our NYC broker affiliates must be extremely efficient if they are receiving effectively nothing versus $120,000 in commission for the average NYC sale. That means a reality check in terms of expectations for 24/7 help, service and phone support. Absolutely not. Our affiliates have no obligation to take on any or all of the customer referrals we direct their way. This means that customers who abuse the essentially free service we are providing will likely be rejected or fired by our affiliate listing brokers. Moreover, in the event of abuse, disrespect or harassment of our affiliate listing broker by the customer, our affiliates reserve the right to cancel the listing agreement and refund a pro-rated share of the flat fee back to the customer. Our affiliate listing brokers are all full-service, traditional REBNY Member Firms who also have full-commission, full-service clients to look after. The benefit of this method is that your affiliate listing broker will have none of the possible reputational damage that a typical “discount broker” will suffer. In return, our customers are expected to be respectful and behave professionally towards our affiliate listing brokers. These traditional brokers have taken personal risk to break ranks with the rest of the brokerage industry to help you save money on your real estate transaction. They are risking their own reputations to discreetly help you sell your home for less than 6% in commission. The upside for them is an enhanced reputation from having more listings and the potential for buyer and seller referrals to come from the additional business. Because you are getting the ‘deal of a lifetime’ by selling through a traditional broker for 0% instead of 6%, it’s important for you to be appreciative and respectful of the tremendous opportunity you have been given. Learn the intricacies of the sale process in NYC, including how to handle listing inquiries, how to negotiate, how to to prepare a board application and how to prepare a deal sheet. Effectively show your property and answer questions from interested parties without being overbearing, too aggressive or simply off-putting to buyers and brokers. Keep a level head while negotiating and juggling multiple inquiries of interest from buyers and buyer agents. Work through the bureaucracy of your managing agent to secure board approval for your buyer. You aren’t available on most weekends for open houses, and you’re rarely available during the day to accommodate private showing requests. You’re not interested in calling back buyers and buyer brokers and following-up with leads on a consistent basis. You’re easily prone to lose your patience while scheduling appointments or become compromised emotionally during negotiations. You don’t have time to learn the intricacies of how the sale process works in NYC. You simply don’t like interacting with buyer agents or any real estate agents. You aren’t interested in offering a buyer agent commission. You’re simply not comfortable in a sales role.